Clearly, SEA had a preference. They took the full 40 seconds getting the 2nd down play off, trying to take as much time off the clock as possible. They anticipated scoring quickly and did not want NE to have enough time to respond. We all know the final outcome, but that could not have been anticipated with any confidence at the time of Belichick's decision. At the time, I thought it was a big mistake by NE not to use a timeout. If SEA scores on the next play, NE has over 50 seconds left and a timeout to respond, which is plenty of time for a FG drive in the modern game. And if SEA takes 2 plays to score, NE could use their final timeout to preserve over 45 seconds to respond, still enough time for a FG. There are a lot of different paths based on when or if SEA could score, so the simulator is probably the right tool for this analysis. I set the WOPR to run two scenarios, one in which NE calls a timeout, and one in which they let SEA run the clock down. The difference of about 4 percentage points of win probability means that NE would have about an 8 to 10% chance at a comeback FG drive to tie, which is consistent with endgame drive percentages. I don't buy the suggestion that Belichick could anticipate that SEA would burn so much time before the second down snap that they'd be forced to throw at least once, which would take Lynch out of the equation for a play, and so on. There's just way too many assumptions and possibilities to consider. I'd buy that he could, generally, prefer to put all the pressure on SEA. However, the cost of doing so forfeit any opportunity to respond. 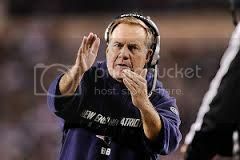 The final outcome aside, I think Belichick should have used his timeout.